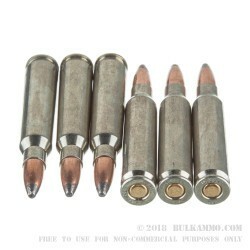 Every bit as accurate and tightly controlled as any other imported value round, this ammunition is particularly good in military style firearms where the feeding and extraction is consistent and stiff. The zinc plated steel tends to function very well in normal tolerance firearms and is best without trying to make it work perfectly in ultra tight chambers and tolerances of a match rifle. 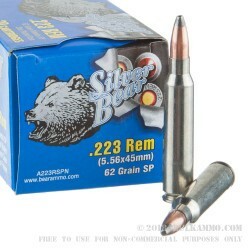 This is quality ammunition, especially if you know your rifle already likes steel casings. The quality of this production is high, and the value of the components is exceeded by their collective impact on target, whether that impact is on a steel target or a live one. 62 grains in the form of a soft point jacketed projectile, that is sufficient for hunting, but also offers great accuracy and plenty of stopping power for paper or steel targets. This stuff is really cheap and really solid. Suitable in any rifle, though not a perfect fit for match tolerances or firearms where you need sub MOA accuracy consistently (though this ammo is generally capable of it). The best fit for this ammunition is in AR/Clones and mainstream rifles and pistols that are used for a variety of tasks and are not ultra precision builds specifically. Q: How much FPS velocity? A: Hello Peter! 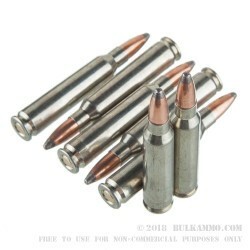 The manufacturer lists this ammunition as having a muzzle velocity of 3,050 fps. Q: Is this ammunition corrosive? Or is it non corrosive? Thanks. 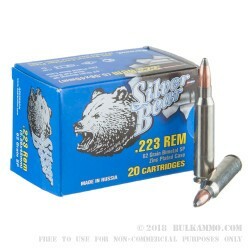 A: Hello Austin, The Silver Bear .223 is a non corrosive ammunition.